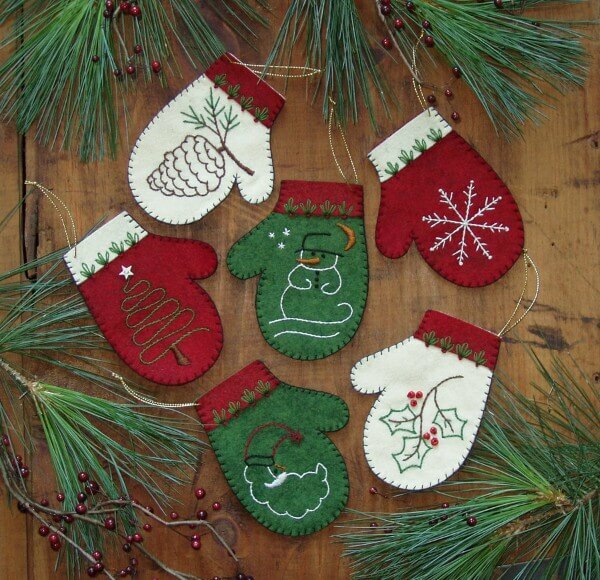 A collection of six mittens each with a lovely embroidered design to celebrate the holidays! Mittens open at the top and can be filled with candy canes, money, or tiny treasures. Design motifs include a plump snowman, jaunty Santa, stately pine tree, pine cone, holly sprig, and delicate snowflake. Suitable for trimming the tree, decorating packages, and gift giving. Ornaments are approximately 4 1/4in high.